Hofburg is is a palace located in Vienna. The palace was once the winter residence of the Habsburgs Dynasty for over 600 years. In the summer months they stayed in the Belvedere Palace. Nowadays the offices of the president of Austria are housed in Hofburg. 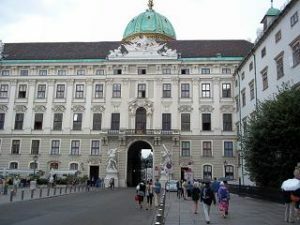 Coming from the Museum Quarter / Maria Therienplatz, visitors go through the Burgtor to the Heldenplatz. 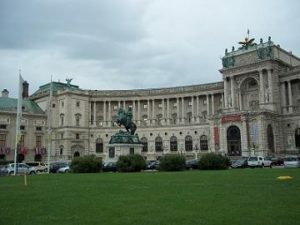 The Heldenplatz is the outer plaza of the Hofburg. In Hofburg palace are several tourist attractions: the treasury (Schatzkammer), Imperial Apartments and the Spanish riding school. The Imperial Apartments were the apartments of Emperor Franz Joseph (1830-1916) and his wife Elisabeth (Sisi). The Schatzkammer includes a collection of royal jewels, the Imperial Crown and the Holy Lance. The palace is in downtown Vienna between the Museum Quarter and the city center. Nearest metro stations are MuseumQuarter (U2) and Stephansplatz (U1). To the metro stations is a 5-10 minutes walk.